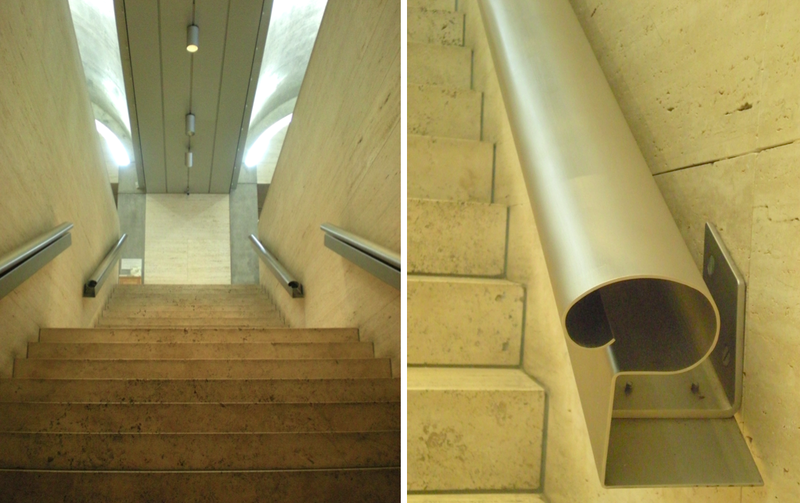 Louis Kahn set an almost spiritual mandate for himself on the Kimbell design: to utilize natural daylight in the most effective manner while simultaneously protecting precious art from the harsh Texas sunlight. His team of consultants and architects, with whom he collaborated closely, often combined basic building materials with technical innovations in new and exciting ways. 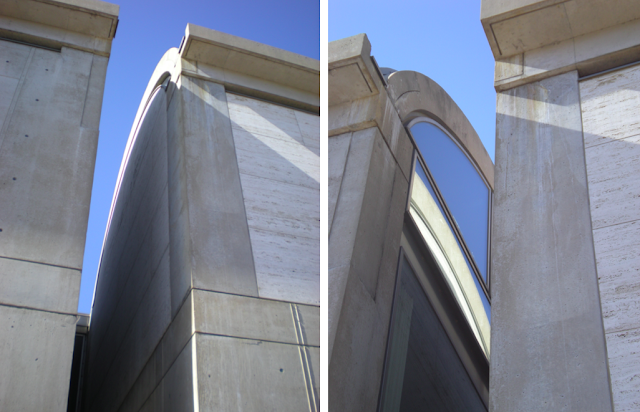 Along the top of cycloid barrel vaults, natural light enters through narrow plexiglass skylights. Wing-shaped pierced-aluminum reflectors diffuse the light, casting a silvery glow onto the smooth concrete surfaces, thus washing the works of art with a subtle, ever-changing light. Details matter. 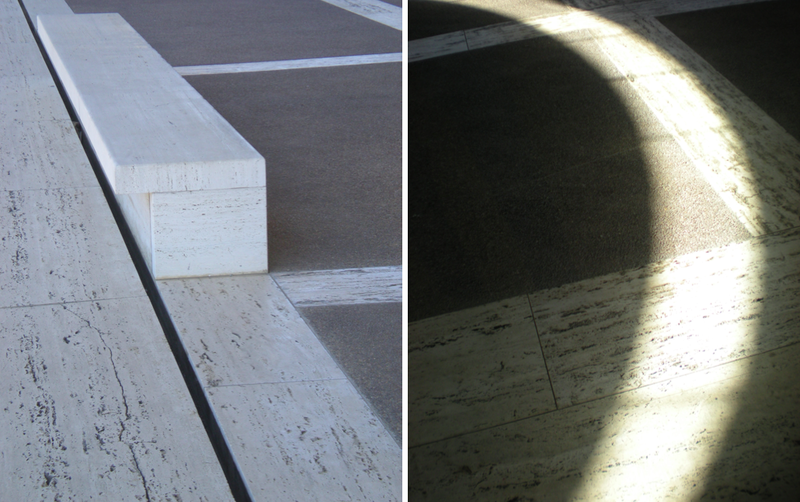 Slits of light appear in unexpected places to quietly illuminate the space within. Surface materials used were few: concrete, travertine, and white oak. 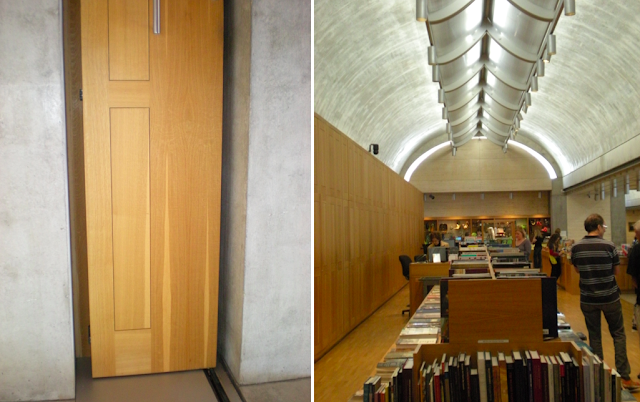 Economy of space is apparent in sliding doors, above left, which allow for any number of gallery configurations; plenty of storage is hidden in the bookstore with what looks to be a 'wall of wood'. The 'open book' store is unlike Louis Kahn, the man. Most of his friends and associates were unaware of the fact that he had three separate families. I highly recommend Nathaniel Kahn's Oscar-nominated documentary, My Architect, A Son's Journey. In it we follow him on his discovery of his unknown siblings and their father, the complex man whose architecture was brilliant enough to change the field - and even a country - but who, paradoxically, was found dead in a men's bathroom stall at Penn Station with neither money nor identification. Offices on the lower floor are lit through a one of three courtyards that were created by slicing through the vaults. A perfectionist, Kahn often took years to arrive at the final design for a project. Honest, deceptively simple use of common materials belie the complexity of his architecture. ....the Modern Art Museum, just steps away. 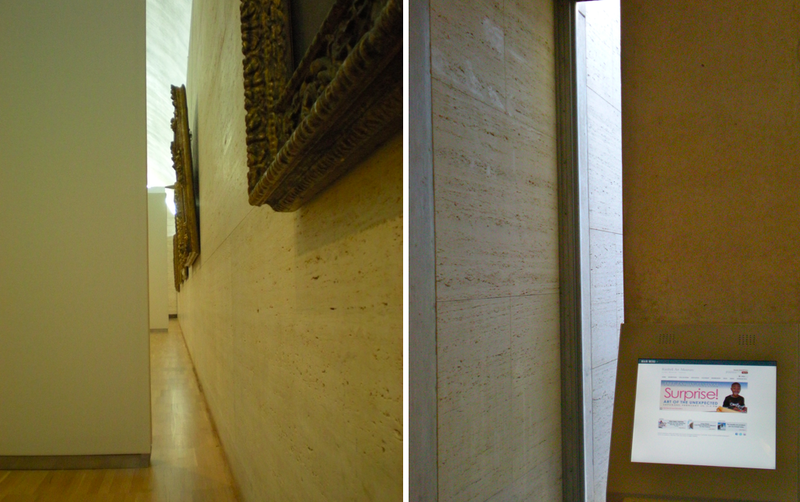 Note how architect Tadeo Ando honors his predecessor by mirroring the Kimbell's five vaults in rectangular form. In stark contrast to the astere front entrance, the opposite side of the museum offers beautiful cool pools of water and a shaded open-vault walkway.